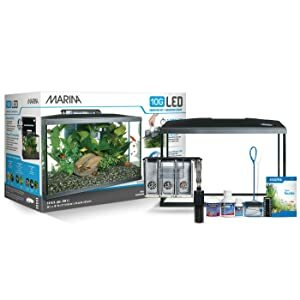 Sold by AquaSprouts and ships from Amazon Fulfillment. 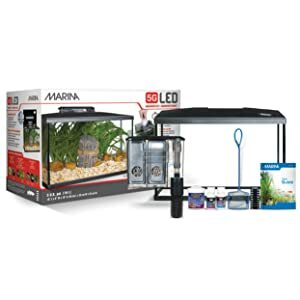 Sold by D&K Mart and ships from Amazon Fulfillment. Size: 16" L x 8.5" W x 10.5" H.
Size: 20" L x 10" W x 12.5" H.
Size: 24" L x 12.5" W x 16.5" H). 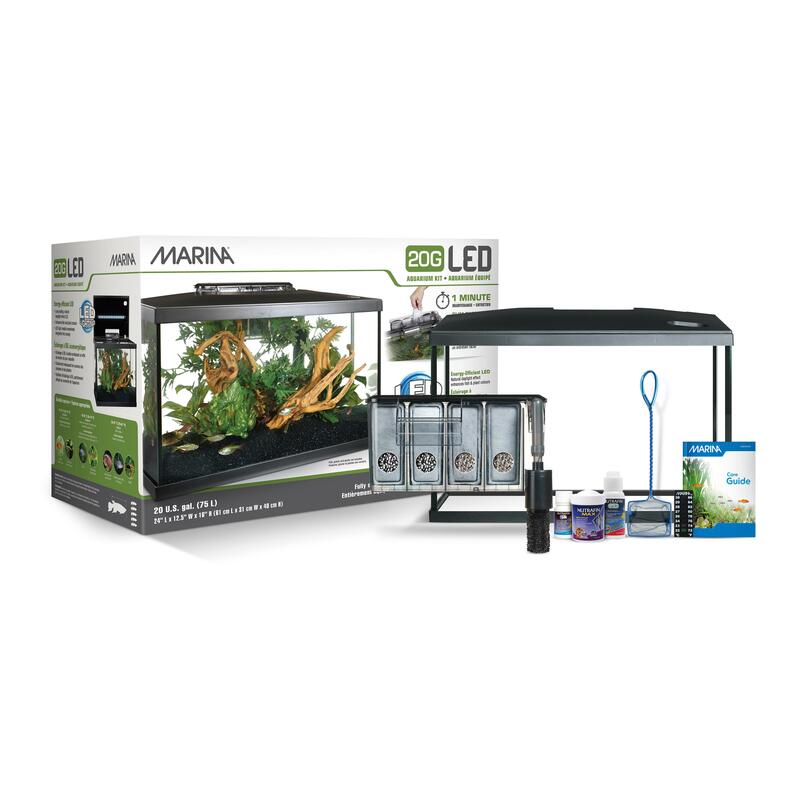 Ideal for the beginning aquarist, the Marina 10G LED Aquarium Kits comes equipped with everything needed to make the novice fish hobbyist's first venture into the wonderful world of fish-keeping an easy and enjoyable experience. 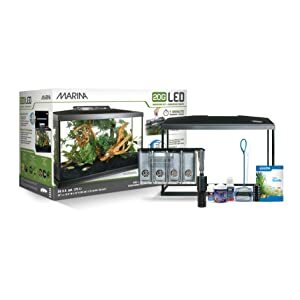 This 10 gallon all glass aquarium features a long-lasting, natural daylight effect LED lighting module incorporated into aquarium canopy and includes everything you need to get started! 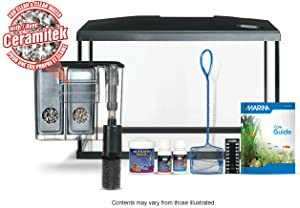 This kit includes fish food to keep fish healthy, Aqua Plus Water Conditioner to make tap water safe for fish and Cycle Biological Supplement to create a biologically well-balanced and healthy aquarium environment. 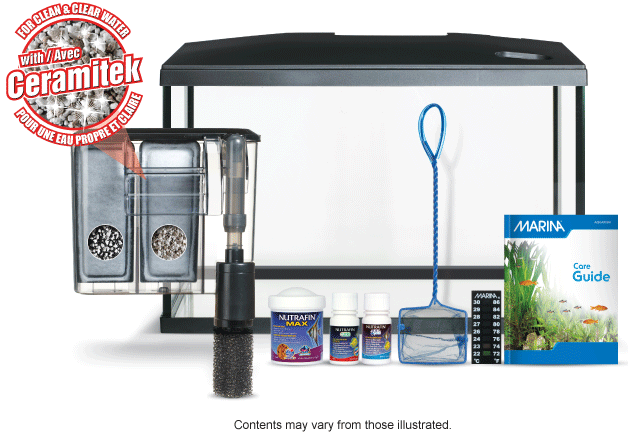 It also comes with a net and an aquarium care guide that includes advice on how to set up and maintain your aquarium. 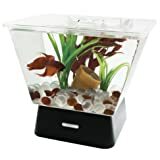 It is your turn to pick your fish!. I'm a novice and this is a pretty good setup for a beginner. 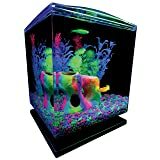 Once you delve into aquariums and educate yourself, you will realize that you should have built Frankenaquarium tailored to your vision but it's hard to figure that out until your chest deep in this. But this is a process and you've got to start somewhere so this is as good of a place as any. Filter is quiet. 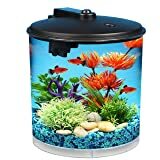 You'll need to buy a heater if you plan on tropical fish which seems to be the majority. 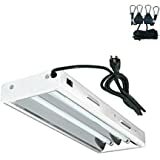 I keep the temperature in the mid to high 70s which is generally about 10-20 degrees below ambient temperature, so I went with a 150 watt heater Aqueon Pro Heaters 150W. 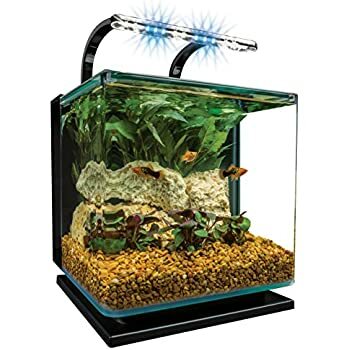 If you want colored lighting for say GloFish or ambiance, then you'll have to purchase that separately. 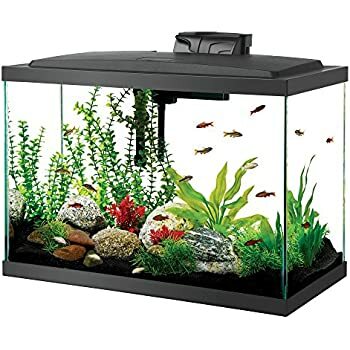 You'll need to purchase substrate, decor, an aeration system (pump & airstone), and other miscellaneous equipment as well. 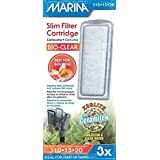 Costs will add up beyond the tank and filter but nothing outrageous. 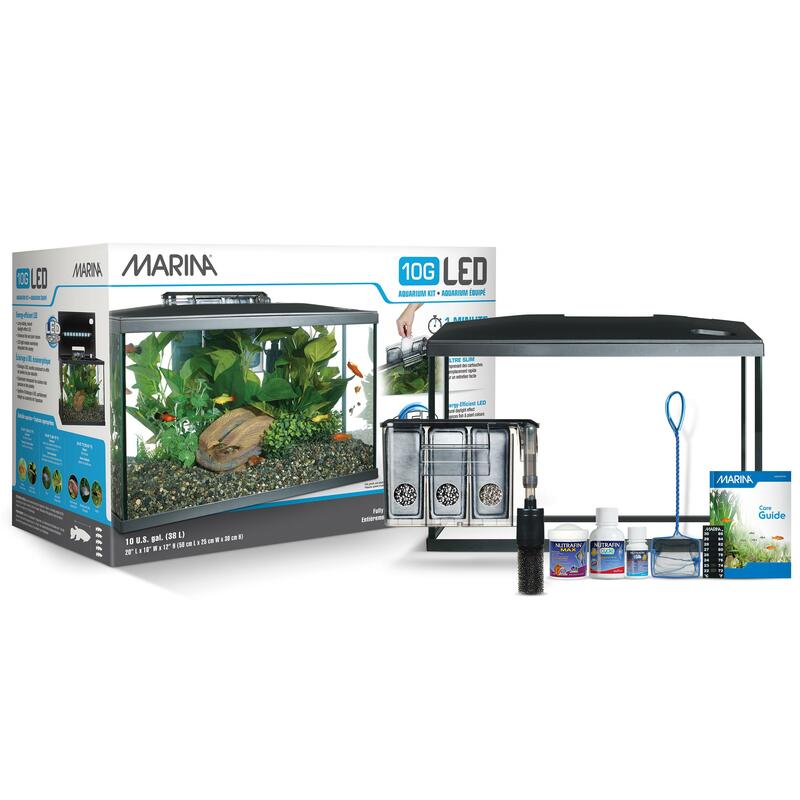 Also learn about cycling your tank prior to purchasing fish. Just trying to prepare other first timers. 5.0 out of 5 starsFab tank!! Ok, I have had this tank for several months now, and I still can't believe how fantastic it is.. I was concerned there wouldn't be enough light for plants, but I keep having to transplant because they grow so fast and healthy!! 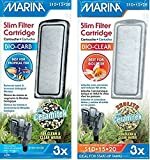 Follow the directions (only replace one filter at a time) and you will have a fantastic clear tank!! I've even had my shrimp multiply!! 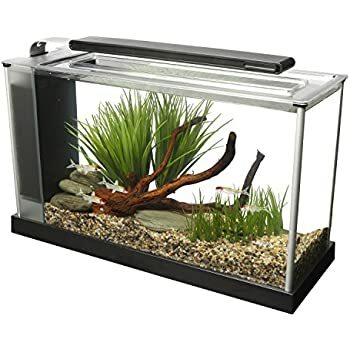 Be sure to put in a base gravel for plants before you put in the regular gravel, they will do much better. 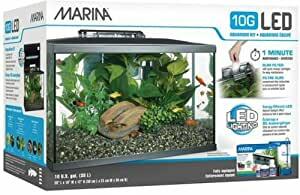 This is one tank you will not regret getting!! 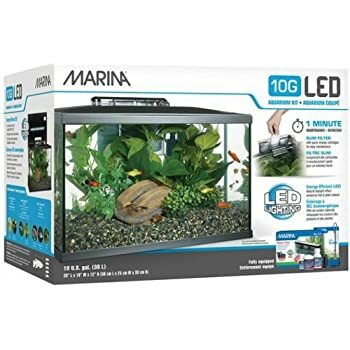 Great tank for someone looking for an "all you need" setup.... 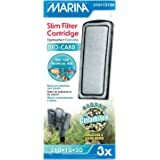 The filter works fabulous for his size tank... The only thing I added was an airstrip with an air pump , and really you don't need it, but I wanted the bubble effect. 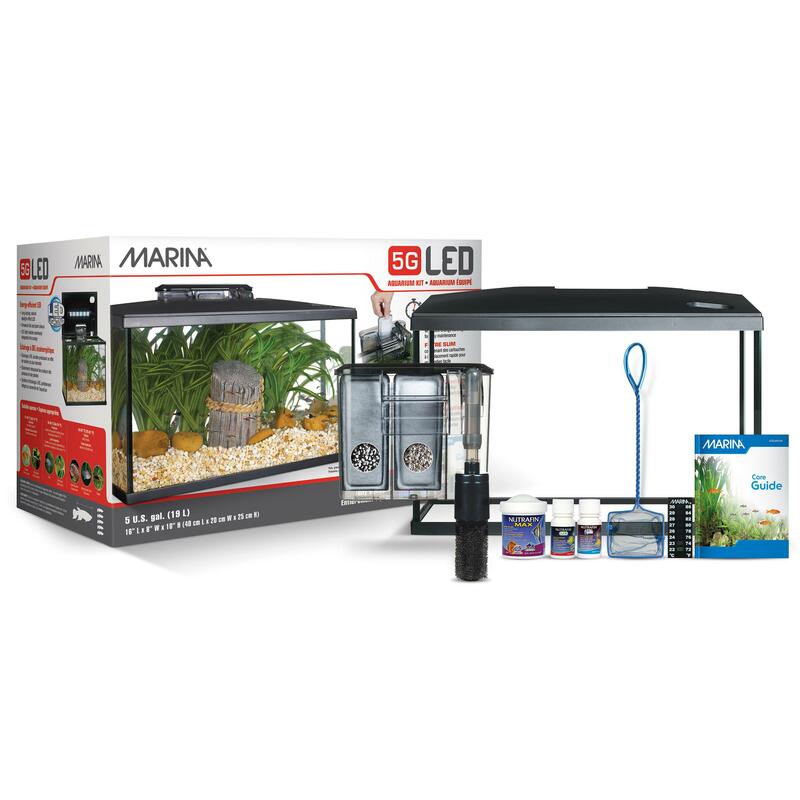 And I also added a heater (most tropical fish need this) Great setup for the price! Would buy it again for sure! 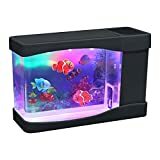 5.0 out of 5 starsHigh quality all inclusive aquarium set. We bought the 5 gallon size for my daughter, fit the small bookshelf space perfectly. 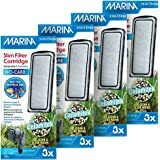 Everything we need came complete in the box, filter, light, cover, didn't have to run out to buy a single thing! The cover is especially nice since we have two cats. 5.0 out of 5 starsNice starter tank! I'll try and remember to update this review next year or if something bad happens. No update means we're still happy! Love it! 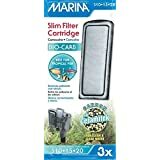 The lid is sleek and the filter is silent and doesn't take up too much space. 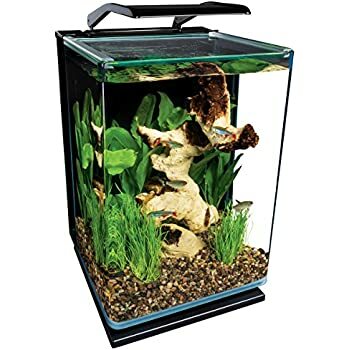 I agree with the previous post, this is a great aquarium! 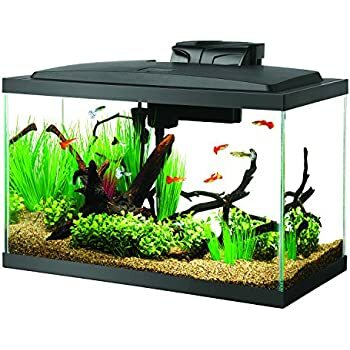 My display tank sprang a leak and I had to act fast. 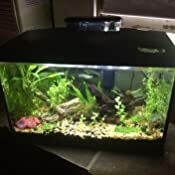 I found this tank at my local store for $70 and bought it out of desperation. I'm happy to say that it has turned out to be an excellent purchase. 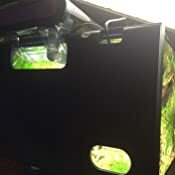 I put my Radion light on it, so I can't vouch for the lighting system it came with, but the filtration system is keeping my sps, lps, acros, clownfish and two bubble tipped anemones very happy. 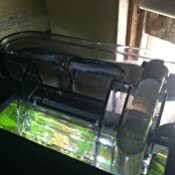 The filtration system is surprisingly quiet which is great since the tank is in the living room where we watch tv. 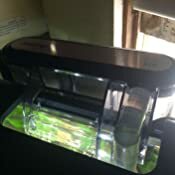 Very happy, the filter is quiet and has adjustable flow, the net works well, i didn't use the food or conditioner as i already had that, tank looks nice, My Betta fish seems very happy in his new home. 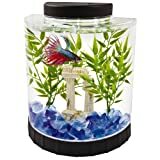 So much more active than he was in his little 1 gallon tank, I recommend for betta fish!